The following sermon was preached in Augustana Chapel at the Lutheran School of Theology at Chicago on Ash Wednesday of 2018. Audio of this sermon can be found here. Almost exactly two years ago on an Ash Wednesday like today, I made the walk from my former parish to the home of a young couple in our community who’d just given birth to their first child. It had been a tumultuous year for them, as this young mother’s own father had been diagnosed with an aggressive form of liver cancer midway through the pregnancy. At a time when life is already measured in weeks and trimesters, she and her family were marking the passage of time along two fragile timelines — the number of days until their child would be born and the number of days until their father would die. The cancer moved quickly, and the grandfather left this world weeks before the grandchild entered it. She was brought home from the hospital on Ash Wednesday, so I made my customary visit with the family carrying two familiar things: a book of blessings by the Irish poet, priest and philosopher, John O’Donohue, and a small ceramic saucer filled with black ashes. As I enter my new family, may they be delighted / at how their kindness comes into blossom. / Unknown to me and them, may I be exactly the one / to restore in their forlorn places new vitality and promise. / May the hearts of others hear again the music / in the lost echoes of their neglected wonder. If my destiny is sheltered, may the grace of this privilege / reach and bless the other infants who are destined for torn places. / If my destiny is bleak, may I find in myself / a secret stillness and tranquility beneath the turmoil. May my eyes never lose sight of why I have come here, / that I never be claimed by the falsity of fear or eat the bread of bitterness. / In everything I do, think, feel, and say, / may I allow the light of the world I am leaving / to shine through and carry me home. After reciting the blessing over this newborn child I asked about the ashes, wondering how they would respond to this sign of our inescapable mortality only two days into their daughter’s life. “Do you want her to receive the ashes?” I asked. “Yes,” they nodded. “It seems right.” So we prayed together, asking God to use these ashes to remind us of our mortality, not so that we might live our lives terrified of death, but so that we would be encouraged to wring every drop of joy out of the gifts of the lives that God has given us. “Anna,” I said, “our God is gracious and merciful, slow to anger and abounding in steadfast love” and “we are dust, and to dust we shall return.” I made the sign of the cross on her tiny forehead with dark ashes in the place where soon after she was washed with water and anointed with oil. My parents’ wedding blessing for me and Kerry, rendered beautifully in watercolor by the Rev. Megan Clausen. On the day of our wedding, my parents offered Kerry and I a blessing of their own organized around four hard-won truths from their marriage: 1.) Life is full of wonder and miracles, 2.) life is often hard, 3.) relationships are messy and complicated, and 4.) life is short and precious. For our first anniversary I asked Megan Clausen, a recent graduate of this institution who came here from the same congregation in Des Moines, Iowa in which I also grew up, to set their words over one of her beautiful watercolors. The result hangs in our living room to remind us of that blessing every day, so that I cannot read the words “Life is short and precious” without also seeing the brilliant oranges flowing next to the rainy grays and the starry blues she painted. Whether it’s “remember that you are dust …” or “life is short and precious,” the message is the same. You are alive and that is a gift. Live like you know it. Spend your days and weeks giving birth to the life you long to live. Spend your seasons building the world God calls us to inhabit. Spend your lives like they mean something, because they do. Because you are someone’s beloved child, you are fearfully and wonderfully made (Ps. 139:14), you are chosen, a royal priesthood, a holy community, God’s own people (1 Pet. 2:9). This great love is the fuel that feeds the fire of Isaiah’s holy anger at the world’s injustice, not guilt or shame, but love set loose in public to name the harms that follow from all our chasing after things that rust and decay. Our world, which so quickly assigns human qualities to commodities while treating people like objects to be bought and sold, is diabolical in its efforts to get us to willingly spend the most basic currency we have — our lives — investing in the very things that tear us apart. Then the moment comes (and it comes more than once) when you realize that the things you’ve been chasing aren’t really life at all, and the moments you have left are precious and few. You come face to face with your regret and wish you had spent your days differently. In that moment, as in every moment, God is waiting for us. It is not too late. “Then you shall call, and God will answer; you shall cry for help, and God will say, ‘Here I am.’” (Isa. 58:9) Here I am. Beloved community, we have arrived once again at this day which comes to us with the same regularity that brings new life to the tree, fresh flowers from the bulb. This is the start of the season that ends with our resurrection. It is not too late, it is never too late, to treasure each day of your life, to invest yourselves in the people and places that matter, to bless the world and our God who made it with the lives you have been given. It is never too late to live like you are really alive, which somehow is easier to do when you remember that you too are dust, and to dust you shall return. I took a class in college called something like “Conceptual Physics,” but which we all called “Physics for Poets.” It was a physics class without any math, mostly taken by English and other humanities majors in order to fulfill a distribution requirement in the sciences. We studied things like Newton’s law of universal gravitation and Einstein’s theory of special relativity using stick figures named Moe and Joe sketched out on the chalkboard by our professor, Dr. Kim. I don’t really fancy myself a poet, though I try my hand occasionally, but the link between the science of the observable world and the theologies that connect my experience of the world to my knowledge of myself remains. Physics sometimes, unexpectedly, helps me understand religious concepts. For instance, hope. The German physicist Werner Heisenberg, a pioneer of quantum physics, published a paper in 1927 that described the unavoidable imprecision that enters when trying to plot both the position and momentum of an object. He was thinking of unimaginably small objects, like electrons or photons I suppose, not soccer balls. His idea, which we now call Heisenberg’s Uncertainty Principle, says that the more closely you try to pin down where a thing is, the less accurately you can say how quickly it is moving, and (I think) what direction it is moving in. Conversely, the more accurately you describe the velocity of a thing, the less accurately you can describe just exactly where the thing itself is. Now, remember, Heisenberg was writing about quantum physics, laws of nature operating at an unseen level. Fortunately for us, for most of our waking days, we do a pretty good job of determining where, how fast, and in what direction objects around us are moving (which is why we are able to play soccer). But when we begin asking questions about the inconceivably small, invisible and practically undetectable world around us, operating at the microscopic level, different rules apply. So, and here’s another piece of physics for us to mull over, the harder you try to observe things at this level of existence, the more likely you are to actually alter what you are looking at. This is called the “observer effect,” and if you’ve ever used a tire gauge to check the pressure in your tires, you already know what I’m talking about. You know how this works, you unscrew the tiny cap to the inner tube of your tire and, as you apply the gauge to the tire, you hear the hiss of air being released. You wanted to know the pressure in your tire, but the very act of measuring the pressure has changed the pressure itself. In quantum mechanics the same thing happens. In order to observe objects at the sub-atomic level, like an electron, we have to direct photons at it, which actually changes the path of the thing we’re trying to observe. There is no neutral observer at this level of science – to watch is to participate. A long time ago I picked up a habit from a dear friend of mine who has spent most of her life practicing the art of counseling and, in particular, counseling people around issues of oppression and its impact on their lives. She very intentionally greets people by asking, “what’s new and good?” I’m sure you’ve heard me repeat the greeting plenty of times myself. This isn’t arbitrary on my part. It’s not just another way of saying, “what’s up?” Although I’m interested in knowing what’s persistently old and difficult, I often choose to begin small groups by asking “what’s new and good?” because I believe that choosing to focus, training yourself to observe, what is new and good in the world is a spiritual practice. Although each of us has a multitude of stories we could choose to tell about our lives, when we practice looking for the new and the good, we are choosing to find evidence that the past doesn’t define the future – that old hurts do not cut off the possibility of future healing, and that signs of that new life are already appearing. As with any spiritual practice, choosing to look for what is new and good in the world is not easy and does not come naturally for most of us. Like the painful throbbing of a stubbed toe, old injuries stick with us and demand our attention. Chronic pain, ongoing illnesses and the injustice of oppressive systems that surround us make it difficult to concentrate on what is emerging and new, what is healing and hopeful. The wildernesses in which we wander feel so arid, and maybe especially so during this season when the desire to create the perfect Christmas for our families and children is at odds with the struggles we face at work, at home, or as a nation. Our country feels more divided than at any moment in recent memory. Isaiah’s promises feel far off, so far off that we doubt we will ever see them in our own life. Martin Luther King, Jr. famously said, “the arc of the moral universe is long, but it bends toward justice.” Justice, these days, can feel hard to find. It can seem tiny in the face of personal tragedies and ongoing wars, almost microscopic. We would like to know precisely where God’s justice is, and when it will arrive. But theological physics seems to indicate that we cannot know precisely where God’s justice is and how quickly it is moving – only that it is on the way, and that our own search for the signs of God’s justice, in fact, changes the world we are trying to observe. So, in this moment when racist organizations we once imagined to be on the fringes of society are gaining confidence and organizing themselves into a global movement, I am choosing to celebrate the news that the Army Corps of Engineers sided with the water protectors at Standing Rock. I am finding hope in images of military veterans kneeling before elders of the Lakota Sioux tribe, offering an apology for centuries of violent oppression and exploitation of Native peoples. As we listen to newly emboldened anti-immigrant rhetoric moving from the margin to the middle of American discourse, I am encouraged by the actions of states like California and sanctuary cities like Chicago that are putting mechanisms in place to resist mass deportations should the federal government move against our neighbors under the cover of paranoid fantasies and slanderous lies. I am looking for what is new and good in the world. I am perfecting my perceptions. I am practicing hope, and I am waiting with patience for the fulfillment of God’s promises – knowing that as I look for evidence of God’s work in the world, I am drawn into that very work. What are you looking at this Advent season? What are you looking for? How are you training yourself to seek and to find evidence of God’s movement in the world? I know it’s hard. I know that! The temptation to constantly rehash all that is old and wrong and broken is ever-present. But I also know that there are no neutral observers. To watch is to participate. It matters which stories we tell. It matters, the conversations we have. Do you say it’s all falling apart, or do you say the moment for radical transformation is finally upon us? It matters! Stay awake, therefore, and watch for the coming of the Lord. 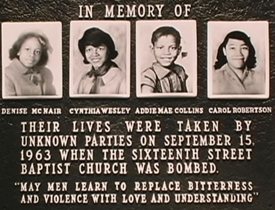 The four girls killed in the 1963 bombing of the 16th St. Baptist Church in Birmingham, AL. That was fifty years ago, and this morning I want us to ask ourselves if, indeed, the innocent blood of those four little girls has caused the South, the North, and the whole of these United States to come to terms with its conscience. “Over the past few weeks, Black churches across the United States grieved and lamented the Zimmerman verdict of ‘not guilty.’ … Many churches of color and others joined in solidarity with Trayvon Martin by wearing their hoodies to worship. Church services addressed concerns of race, the legal system, gun violence, and issues of justice within communities of color. A little further in her article, Cannon describes the reaction Lisa Sharon Harper had to the Zimmerman verdict. Harper is an African American evangelical who works for Sojourners, a national Evangelical organization working on racial and social justice, peacemaking, and environmental stewardship. Fifty years after the nation was jolted out of its racist slumber by the deaths of four little girls in Birmingham, Alabama we find ourselves divided once more by profoundly different reactions to the death of an African American child. Jurors in Florida, a state with laws that make it possible for a person to kill another person if they feel threatened, to “stand their ground,” struggled to determine whose hands were stained with Trayvon Martin’s blood. The issue of accountability is as complex today as it was for the people of Israel in the time of Isaiah’s prophetic ministry. Imagine how confusing Isaiah’s righteous anger would have sounded to the average Israelite, the kind of person who rose early, worked hard all day long, paid his taxes and made his offerings at the Temple. It’s easy enough for us, reading through the text from a safe distance, to join with Isaiah in denouncing the hypocrisy of his time, of rulers and peoples who gather to worship God with their lips but not with their lives. From the perspective of that everyday Israelite, however, it’s not so easy to understand what is being asked for. Those people, like Ryan and Gina who have brought their daughter, Chiara, for the appointed festival of baptism, were simply trying to live their lives with some sense of reverence for God in light of a tradition that was passed down generation after generation. Those people’s offerings in the temple, like Chiara’s baptism this morning, were a way of keeping faith with the traditions that had shaped the identity not only of those individuals, but of a community, of an entire nation. Like the ancient Israelites, we have words and actions we perform as signs of commitment to the God who calls people out of slavery; who brings people into lands of abundance; who restores the exiled; who heals the sick and comforts the dying; who brings new life to people and places left for dead. We have even incorporated Isaiah’s critique of empty religion into our own rituals, so that as Chiara was baptized this morning we asked her parents to promise before God and before the whole Church that they would raise Chiara to proclaim Christ through word and deed, to care for others and the world God made, and to work for justice and peace. But doesn’t Isaiah’s spirit push back against our sense of satisfaction? After all, so many baptized people in the world, so many promises made in sanctuaries just like these, and still so many eulogies being preached at so many funerals. 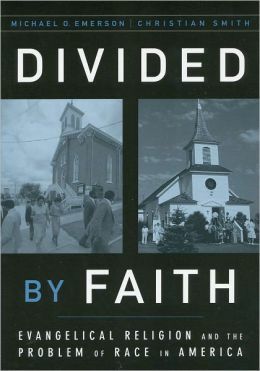 In describing the difference in perception that shapes the radically different response to public events like the Zimmerman verdict by White communities and communities of color, Mae Elise Cannon cites the work of Michael Emerson and Christian Smith, authors of Divided by Faith: Evangelical Religion and the Problem of Race in America. In this regard, I think the historic Black church, and communities of color in general, may be better situated to understand the voice of the prophet Isaiah, who is not, really, addressing the people of Israel as individuals, but as a community, as a nation. The difficulty of a ruling like the one in the George Zimmerman trial is that the jurors were able to find him innocent under the law, even though we know that individual jurors felt certain that he was guilty in some obvious sense. 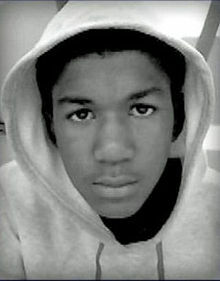 That he was culpable for the death of Trayvon Martin, even if he was not held accountable. It is that gap, the gap between culpability and accountability, through which the stain of a single death spreads out to mark the community around it. It is the tragic gaps in our systems of justice, in our laws, in our public policy, in our sentencing guidelines, in our penal system — systems none of us own individually, but all of us own together — that leave us praying with blood-soaked hands. The ELCA is prompted to speak and to act because so many cries of suffering and despair emerge from the criminal justice system — from victims, the incarcerated, their families, communities, those wrongly convicted, those who work in the system — and have not been heard. Drawing from Holy Scripture, this church holds up a vision of God’s justice that is wondrously richer and deeper than human imitations and yet is a mirror in which justice in this world, God’s world, must always be assessed. A fundamental transformation of mindset about criminal justice is required that challenges the logic of equating more punitive measures with more just ones. Individuals must be held accountable, but every person in the criminal justice system deserves to be seen and treated as a member of human communities, created in the image of God and worthy of appropriate and compassionate response. Because mass incarceration causes significant harms, both personal and social, the ELCA strongly urges those who make and administer correctional policies to take all appropriate measures to limit the use of incarceration as a sanction for criminal offenses. Toward that end, this statement identifies three specific paths: pursue alternatives to incarceration, reform sentencing laws and policies, and closely scrutinize national drug policy. Four other imperatives also require vigorous action from policy makers: the criminal justice system must acknowledge the disparities, and address the implicit and explicit racism that persists within; it must recognize the special needs of juvenile offenders; it must also stop the privatization of prison facilities; and finally, it must foster the full reintegration of ex-offenders into community. I would ask you to pray for our church, the ELCA, as we gather in assembly this coming week. Pray for the Holy Spirit to guide us in all wisdom, so that the divisions that characterize our nation might be set aside for the sake of a probing, prayerful, and prophetic statement from the church God has called to the world God has created, and loves, and is laboring to restore. Pray that the spilled blood of too many children might find a voice in our assembly, so that their deaths might not be in vain. Pray, most of all, that at the end of all our debates and our voting that the church’s action would be more than words, more than one more burdensome solemn assembly. That whatever social statements we pass would find their ultimate expression in the lives we lead and the actions we take as a community gathered and sent for the sake of the world.